Every 11 minutes a child is born with cleft lip and palate. 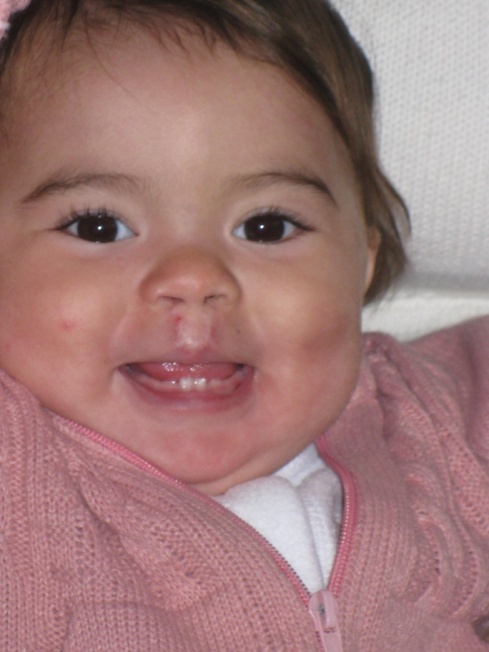 In North Western Argentina, the incidence of cleft lip and palate is estimated at 1 in 450 births. Esteban Lasso, TF’s Executive Director recently visited with Reina, who was born with a bilateral cleft lip and palate in Argentina. We first met Reina in 2011, when Esteban Lasso, and Dr. Bruno Vendittelli, a local Toronto orthodontist, visited our partner project in Argentina. Fundación Gavina, provides multidisciplinary cleft rehabilitation in Northern Argentina and serves Tucumán and neighbouring provinces in Argentina where poverty levels are high. Dr. Vendittelli visited in order to provide guidance and training. He met Reina and assessed her, later applying a surgical tape which gently guides soft tissues and bone into a better position for a later cleft lip repair. He also talked with the doctors about future ongoing care that will be needed for Reina. Reina underwent a surgery for her bilateral cleft lip and palate in December 2011. She is recovering well and is as vivacious as ever! Meet Reina in this video!